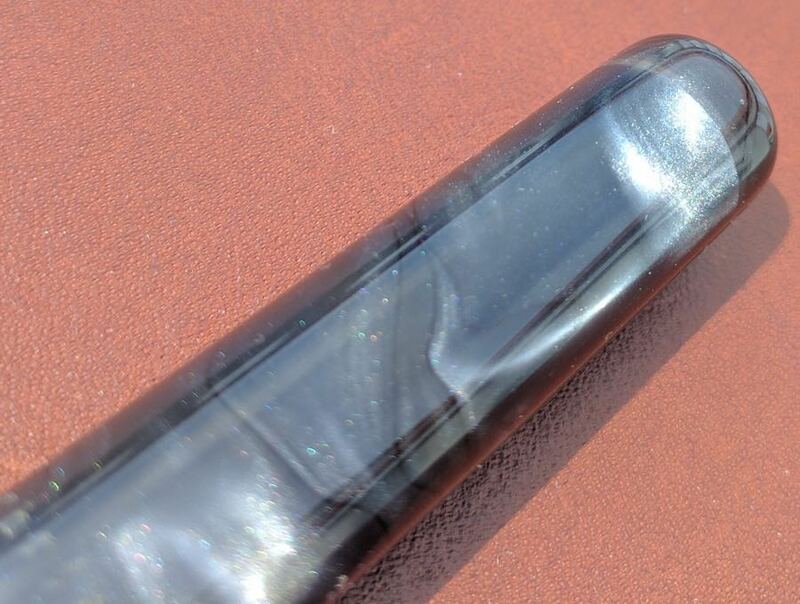 Franklin-Christoph Model 03 Iterum Fountain Pen Review – Pens! Paper! Pencils! Franklin-Christoph’s Model 03 Iterum is a classically shaped fountain pen that’s available in a couple of different acrylics and with a staggering 22 different nib options. It usually has a clip but my version is a rare clipless version that I bought used. At first sight this acrylic might look a little grey and boring but that’s not the case at all. While, yes, it is in fact grey, it’s infused with sparkly clouds of silver that shimmer as you write. It’s a lovely effect and makes the pen far from boring. I find it quite beautiful. 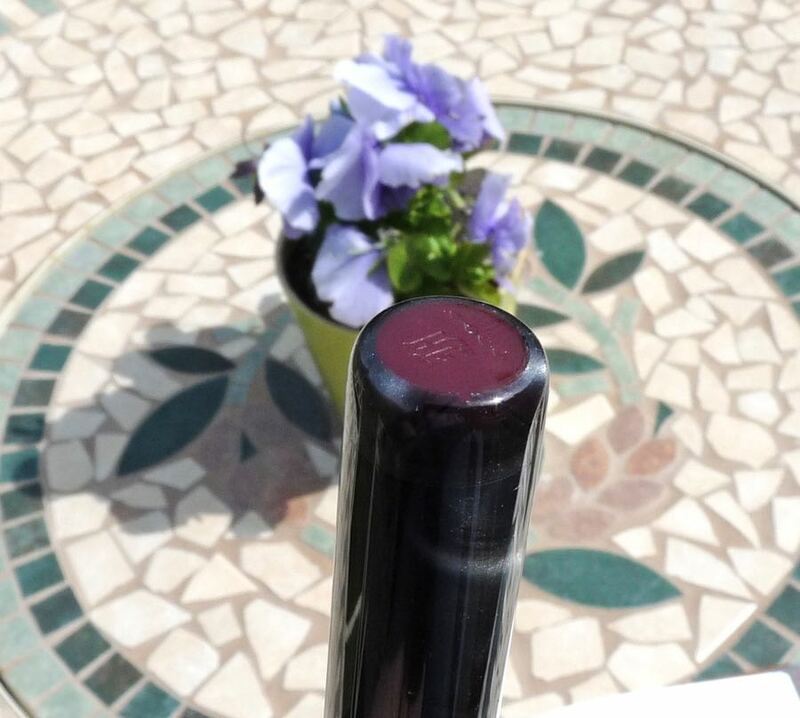 The M03 is slightly on the slimmer side of average and is a good length. It’s light in the hand. Unposted the pen’s going to be comfortable to hold and write with for just about anyone, particularly with the gentle curve of the section. 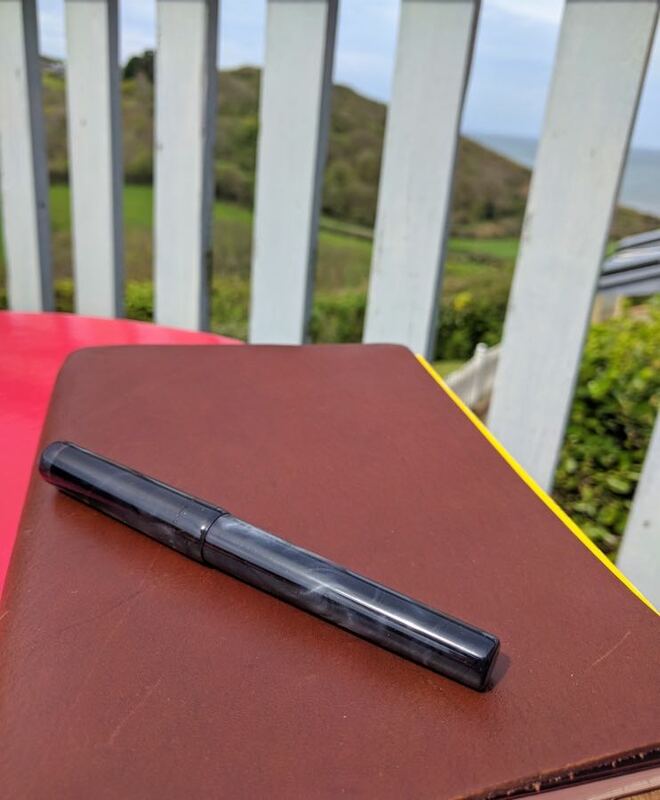 The cap does post but it perches on the end and although it’s unlikely to fall off it makes the pen very long and throws off the balance. Franklin-Christoph have this excellent design for the threads of the caps. They’re chunky and on the section sit right at the end. This means they’re out of the way, not an issue if you want to grip there anyway, look different and interesting in and of themselves, and enable the cap to screw on and off quickly. You can use a standard international cartridge or converter. 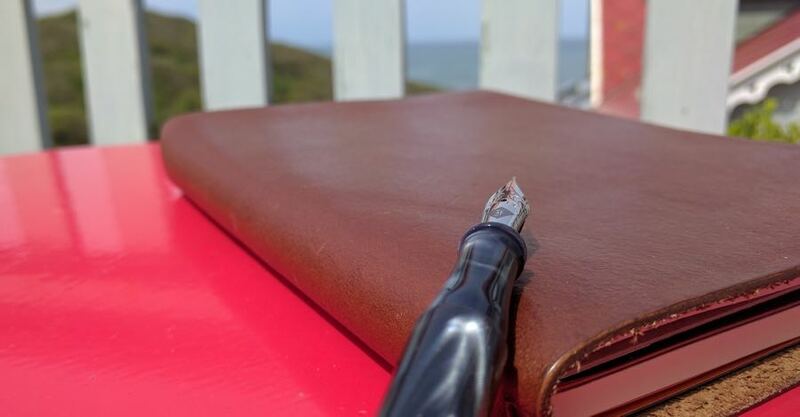 The M03 uses a #6 nib, made by JoWo (always a great idea) and branded by Franklin-Christoph, who as well as the standard range of tip sizes (extra-fine, fine, medium, broad, 1.1mm and 1.5mm) offer a huge music nib (1.9mm) and a range of nibs ground by the master who is Michael Masuyama: needlepoint, fine italic, medium italic, medim stub, broad italic and broad stub. All are available in stainless steel or gold. I bought my pen with a needlepoint nib which is so fine it makes my eyes water and, to someone who likes broad nibs, a little intimidating. 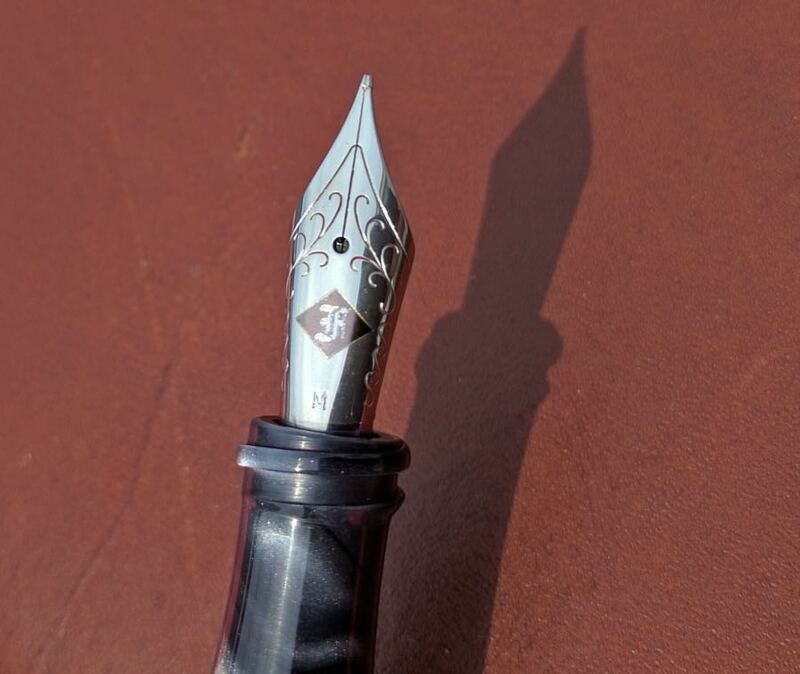 Day to day, I use one of Franklin-Christoph’s stainless steel medium stubs and that is a gorgeous nib. 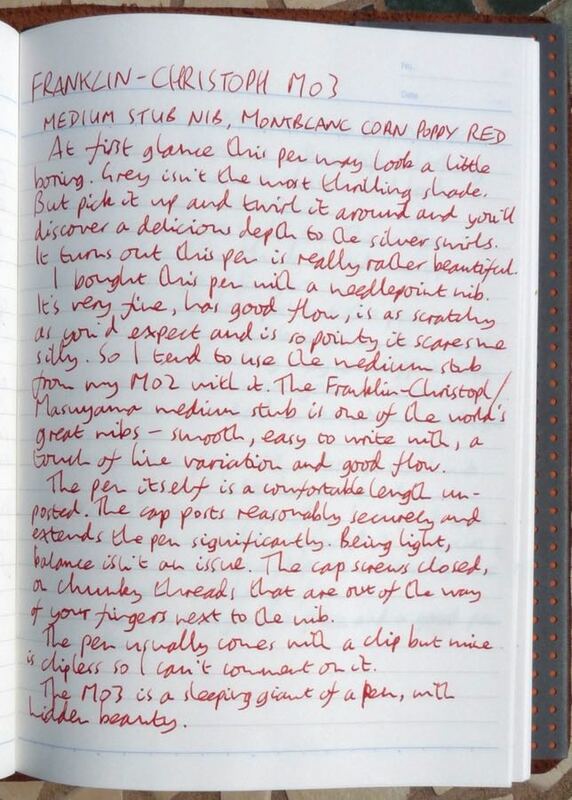 Good flow, some subtle line variation and lovely and smooth across the page. It’s well worth spending the extra $20 to get a Masuyama nib. 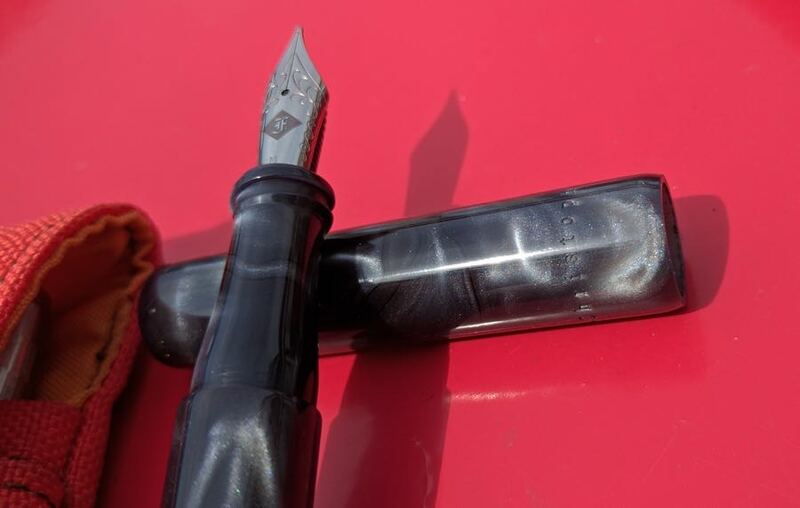 The Franklin-Christoph M03 is not a cheap pen but it more than earns its price tag. It has the feeling of a custom made pen. A lot of thought has gone into its design and the material it’s made from is deceptively beautiful. The nib looks good and writes well. A highly recommended pen. 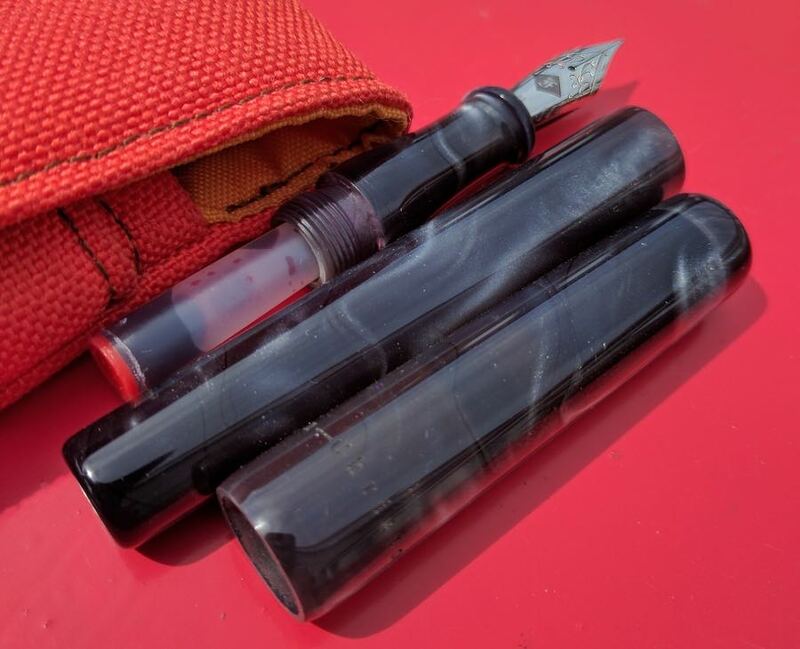 You can find some more reviews of the Franklin-Christoph M03 on Pennaquod. 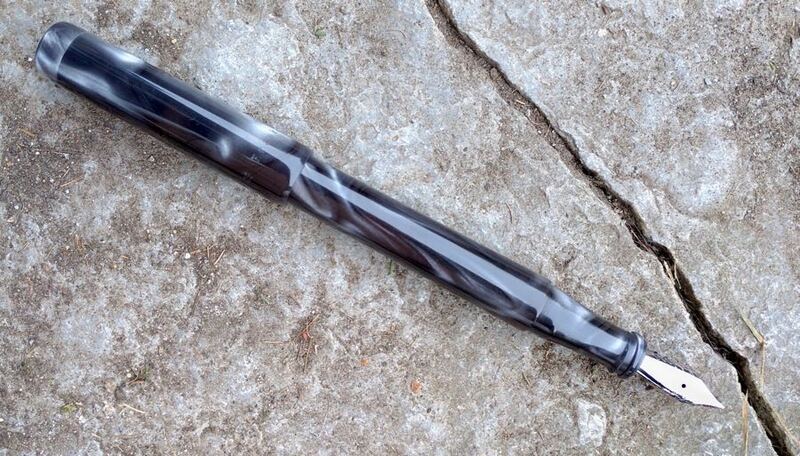 Lovely pen! I have an 02 and a pocket 20, but you’ve convinced me to look closely at the 03s.